My boy has just had a tooth procedure, poor thing. One of his top teeth wasn’t able to come down due to overcrowding and his orthodontist told us we had a ‘Code Yellow situation’ to get him sorted before it either emerged through the roof of his mouth, or finally made a break for it and damaged his two front teeth. I think we were thrown off balance with the move to Canada as regards to getting his teeth sorted but we’re in the clear now, the braces fitted before Christmas last year moved his teeth at speed and now he’s had what they call a tooth exposure. I was back in the UK on the day he had the work done and had to watch him on Skype, puffed up, looking like he’d gone ten rounds with Mike Tyson and feeling as miserable as anything. We’ve managed the pain with arnica and apis (for the stinging) and he has remedies to help with drainage from the anaesthetic. I am so relieved we haven’t had to resort to the Tylenol that was recommended by the dentist because that can be taxing on the liver. The dentist had told him to do no exercise and eat lots of ice cream, which was the only good news he had that day. But now I get it .. the ice freezes the pain. My husband prepared an ice cube tray for quick relief but they also made up ice cream and it turned out the dulling temperature and delicious flavour, plus the World Cup, was a perfect distraction! A couple of summers ago (pre AIP but still grain/dairy free) we holidayed in Sorrento, on the beautiful Amalfi coastline. We had an amazing trip, discovering the ruins of Pompeii and trekking up Mount Vesuvius among other adventures, only strolling past a never ending line of gelaterias was complete torture. The Italians really know how to make, not to mention display and serve, their gelati and it is a huge part of their culture. Trays overflowing with creamy ices in hundreds of flavours, oversized paddles at the ready to scoop their contents into waffle cones or pretty tubs. 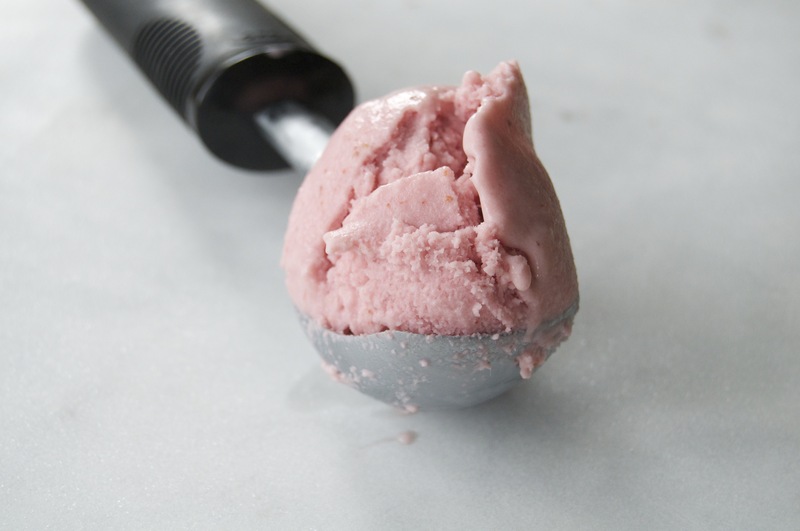 Ice cream or sorbet, anything goes, so long as it’s frozen. My husband, with self interest in mind you’ll understand, ahem, decided it would be child cruelty not to let the children indulge so we compromised by remaining dairy free, but turned a blind eye to the sugar content. So we each had a nightly sorbet, whilst joining other promenaders along Sorrento’s trendy pedestrian streets. Each time I’ve visited Italy, it has always been memorable. I can still taste the cappuccino and tiramisu gelati I ate in Florence in 1990. We had some pretty special fig ices in Rome the Summer of 2000 and local lemon sorbetti in Amalfi a couple of years later. I could tell you anything you like about those ice creams. As for the lesson my girl and I enjoyed in a famous Sorrento gelateria two years ago, I could even tell you their recipes for lemon sorbetti and walnut gelato, though I won’t because they are distinctly not AIP and that wouldn’t help either of us now! 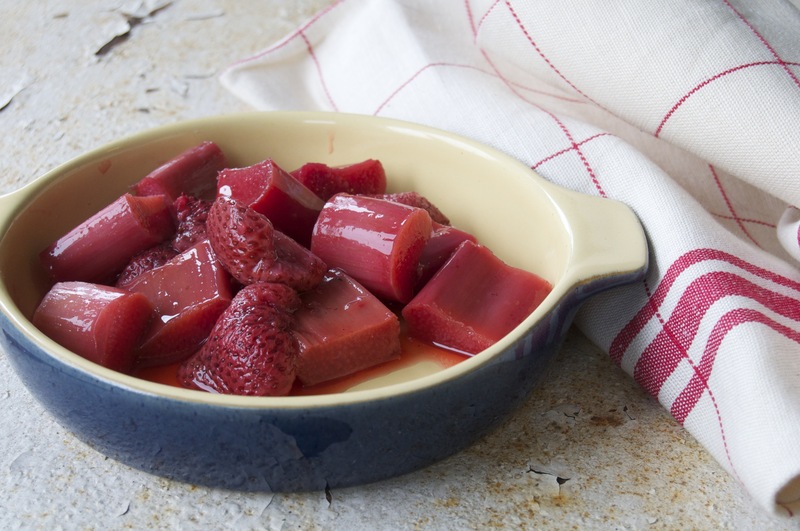 In the previous post I baked strawberries and rhubarb with vanilla and honey which, by the way, is fast becoming a Summer staple in our home. Oh my those flavours make one happy marriage! What I do is cook the full quantity of compote and serve half with a nice big dollop of coconut cream, whilst the remainder is kept for churning into ice cream. Coconut milk is brilliant in ices, its creaminess making the perfect base and, funnily enough the flavour sits so well in the background, allowing the fruits to dominate. 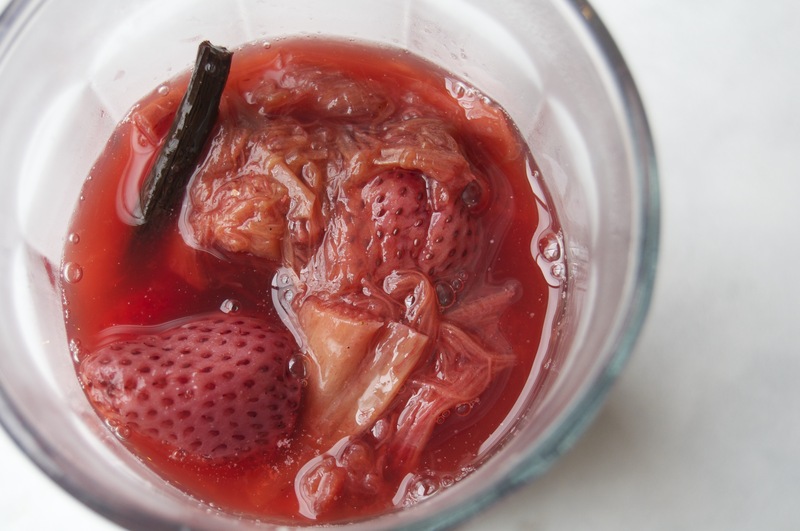 This is a breeze to make, and speedy too if the compote is already made. If you are making this from scratch however, try to be a little organised and bake the compote the night before. If you refrigerate the coconut milk at the same time, you won’t even need to chill the mixture before churning. Bonus! Put all the ingredients into a high speed blender and blitz till smooth. Chill for at least 2 hours. Next, put into an ice cream maker and churn, following the instructions in your manual. If you don’t have a machine, then put the mixture into a freeze proof container and freeze till nearly firm. beat with a whisk until smooth again and return to the freezer. Repeat two or three times and then leave to freeze. 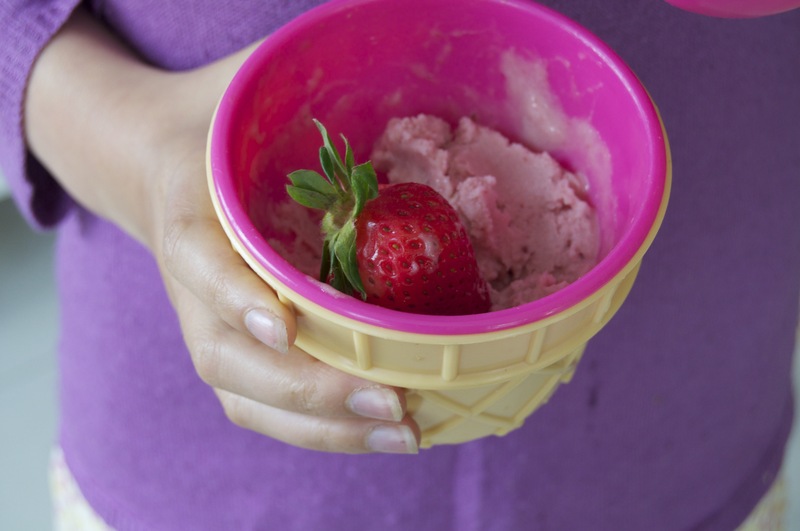 Freezing in this manner results in larger ice crystals and a less creamy texture, but it will still be delicious. Hello, Kate! I’m finally popping by your lovely space here – and getting hungry doing it. This sounds absolutely amazing! Hi kate! I’m eager to try this. I’m about to buy an ice cream maker. 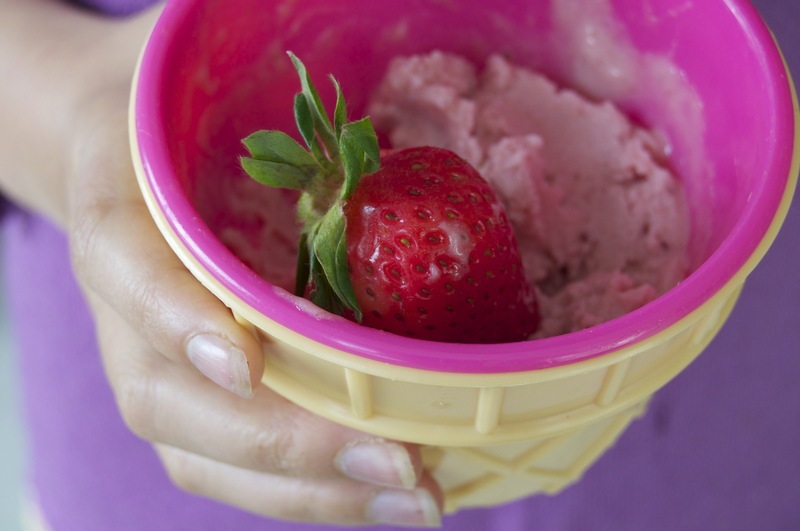 In this recipe do you use a machine that dies t need for the container to be pre-frozen? Or does the freezing of the mixture beforehand suffice? TIA! The mixture needs to be chilled before you can start churning in the machine. My ice cream machine is the sort that has an in-built freezer unit so I only need to chill it for 5 minutes before I start churning and I can make it all day if I choose. If you are buying the sort with the bowl that goes into the freezer, you will need to do this in advance. Does that help? Hi Kate. Bought the new ice cream maker with the in-built freezer. This recipe turned out dreamy. We are hooked! Thanks as always for your brilliant recipes. Glad you like the recipe(s).